Evening All, Spent a good portion of the day at The Woodworking Show in Dulles, VA. Since they only have one more weekend left in their season which will be Charlotte, NC next weekend I know is is a little late for a review but wanted to just post a bit about it. The show has changed a lot over the years I have been going to it and seems to get smaller every year. This year Peachtree did not seem to be involved in the show which that took a bite out of it. That being said a good number of the regular vendors were there and a large number of wood sellers. I bought a lot of wood. I paid for two of the classes this morning and got 4 1/2 hours of class time from Chuck Bender on Joinery and Table Saw Joinery. It was huge amount of information and well presented if but a little chaotic at times (if you know Chuck it was ll good though and flowed together well) He talked about the show a bit at the end of the class and wanted to let us all know a few things. The big name manufacturers and vendors are getting harder to come by. Too many people shopping grabbing information then going to Amazon or some online discount house to buy the products, it is becoming to expensive to send the Reps to the shows and not enough sales being made. The show is looking toward getting more local folks involved in the areas they are in as well as smaller tool makers. The other thing they are focusing on is more of the education. More classes and more getting the information out to continue to expand the realm o f the hobby. With the recent announcement from Popular Woodworking it would be a shame to lose the Woodworking Shows as an outlet to get hands on with the products available and the lose the knowledge of the professionals that present it for such a small cost. Personally not having Peachtree there this year put a little more interaction with the actual vendors they did have there. There wasn’t someone on every corner barking or hocking the products. I hope they continue to work on the design and to see them on the road again next year with new classes and maybe some new vendors. Just my thoughts. Besides the classes I did spend more money on wood. Mostly…. The only tools I bought was a set of brad point drill bits from Arizona Silhouette. The other piece there is from Drillnado I walked past the booth and saw that they now have made a clear piece so you can see the bit. I just mentioned that that was much better as the one I purchased a few years ago was solid, he thanked me for purchasing and after a brief chat remembered me then gave me the new and improved version free of charge. :) Bonus Points to Drillnado!! Have a good rest of the weekend all. Since I’ve moved to Virginia. I’m now about 4 hours to the show in Dullas. I used to go to the ones in Chantilly and also New Jersey. Glad you had a great time. Chuck Bender is a great friend. I’ve talked to him at many shows and been to his shop in PA, before he relocated with Glen Huey at 360 Woodworking. (Now defunct I guess) Not sure where Chuck has relocated. I went to his shop when Glen Huey was teaching a class on a small antique table. Chuck taught my son how to do inlay on a sanding block. And then at a Later Wood Show he taught him how to do hand cut dovetails. Karson, Great to hear from you. I did not know you moved down to VA. Hope you’re able to get a shop set up soon. Basement shops are my favorite. Chuck did a great double class. He has moved back to PA and is now in Jim Thorpe. We talked briefly about 360 and it is no longer in business as he left and Glen kept it going for a while but then folded. I went to the Milwaukee woodworking show and had mixed feelings, I wish Peachtree was there because at Milwaukee they had what looked like a giant junk tool garage sale on tables that were so overloaded they were drooping. I liked that Spiracraft had the store there and Arizona was still there along with Carter tools and Veritas. I went to Jim Heaveys stain class and I also did a demo on turning boxes in the Spiracraft booth. Still have mixed feelings, I had a pocket full of money and only spent $10. @jacksdad- The tool yard sale is a staple of the show it is a guy out of New York that I think buys leftovers by the toms and maybe a few storage lockers. His stuff is hit or miss this year it seemed likely mostly misses. Though a friend did pick up a triton drill set from him for $60, see how it holds up. I missed the little supplies such as sandpaper, belt cleaners and other items I just restock the shop with each year. Groovy56- Hope you get a chance to take in some of the seminars. Chuck’s was worth it if you are interested in joinery. Thanks Chris. Now I wish I had thought in advance and made the drive up. I had to google the Drillnado to see what it was. Clever little DC idea and looks really effective. Looks awfully obtrusive though and I think it would make me cuss a lot. Well, a lot more. I’ve not seen one in Sacramento for a number of years. I used to go when ever they came to town. Thanks for the info CtL. I am planning to go to the show in Charlotte and it will be my first time to any woodworking shows. 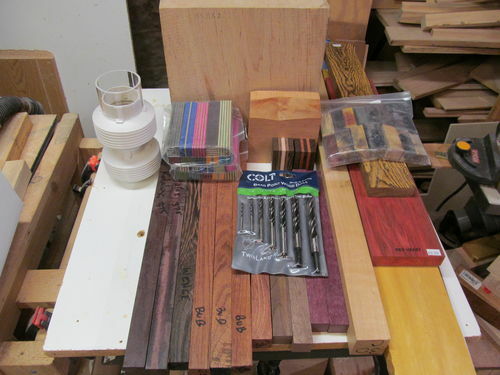 I am hoping to see some interesting tools, attend some classes and maybe find a woodworking group in the Coastal NC area. it sounds like the show just keeps shrinking every year,they dont even come to socal anymore,last show here was a few years ago,i really miss it.don’t know why it was always a big crowd whenever i went.i see you have a drillnado,i guess you have had better results than i did,i hated it so much i literally threw it in the trash.on big bits all it did was clog up and the plastic shroud was a piece of junk.the clear shroud sounds like one improvement though.sounds like you had a good time though,hopefully they will return to our area someday. WayneC and pottz, I think ever since the show got sold off about 5 or 6 years ago now they pretty much do the East Coast only. Not sure why perhaps just cost of transport. My hope is they can resurrect it some and maybe give it a wider range as well.